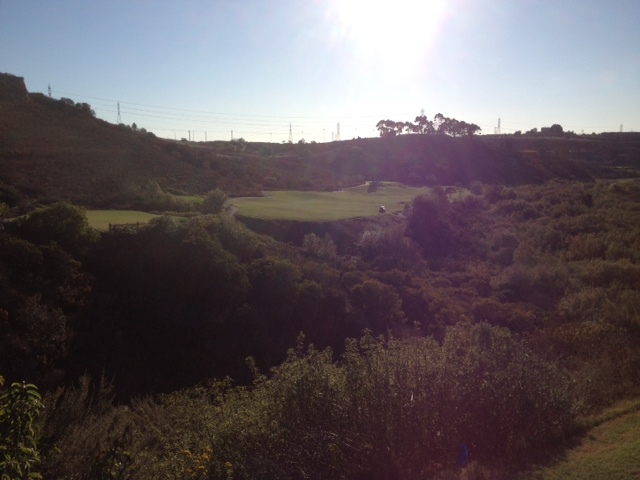 Opinions vary about the Carlsbad’s city course, The Crossings – usually in direct proportion to people’s ability to make the canyon carries – but one group that unilaterally loves it here are the big hitters. The reason why? The par-5s. If you’re long off the tee, you’re a little – or even a lot – longer here thanks to a natural assist on three of the four par-5s. That power boost gives you the green light to go for those three holes in two, although I know people who’ve made all four, but challenging the water on No. 7 seems more an ego play than smart strategy. Length comes in handy for sure on some of the par-4s as well – particularly the brutish uphill No. 6 – but the reward, especially emotionally, isn’t the same as really sailing one on holes 4, 15 and 16, the holes with the elevated tee boxes, and then pondering the possibility of eagle as you drive to your ball. I’ve made three of the four par-5 greens in two and am here to show you the way home and take a closer look at what many probably consider the four most fun holes on the course. No. 4, 572 yards (blacks), 567 (blues), 561 (whites) – No matter where you tee it up, you’re aiming at the same place: just to the left – five yards or so – of the driving stake. Carry the canyon, hit it there and at between 260 and 270 yards, there’s a speed slot that will reward you with 25 or even 30 more yards and a level lie to go for the green. About that green: it’s the size of a helipad, unusually large for a par-5, but that’s what makes it all the more tempting. About the risk: see that sand trap just off the right side of the fairway before the green? It comes up faster than you think. Fly it and you’re OB. If you end up short of the green here, your ball settles into a collecting area, perfect for a pitch in with birdie still attainable. This is your most likely hole to land an eagle. No. 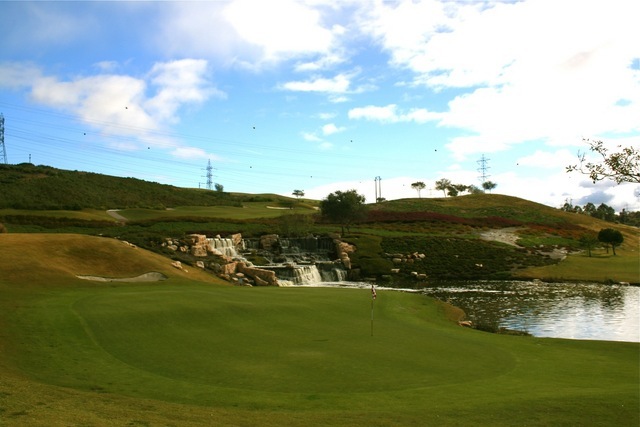 7, 556 yards (blacks), 546 (blues), 529 (whites) – The Crossings’ signature hole, located just past the end of the Callaway driving range, has a slightly downhill fairway that leads to a beautifully landscaped waterfall finish. Really, any tee shot that doesn’t land on the street left here, or too high on the hillside on the right, will do because you’re laying up on your second, but for the thrill seekers that want to challenge the water and try to get home in two, you’ve probably go to be slightly left to give yourself an angle and not be blocked by the hillside. 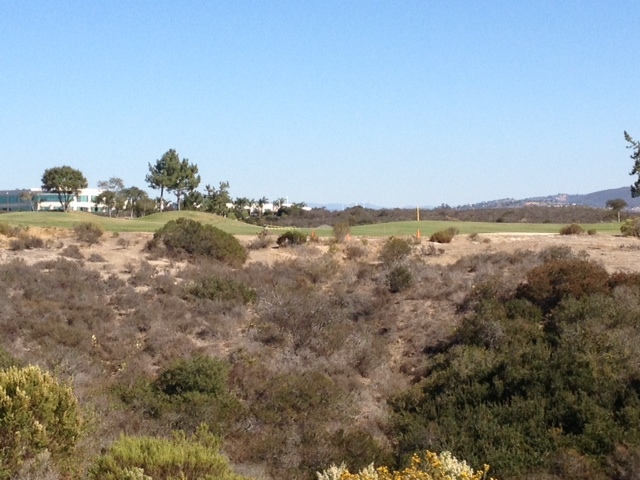 I’m normally driver/6-iron/wedge here into a green with a ridge dividing it into upper and lower tiers. The one way I’ve messed this hole up is get greedy on my second shot and pull it into the bunkers on the left. That’s not an approach shot you want. I’ve splashed down every time. Otherwise, the approach shot can produce some interesting outcomes here. My last wedge in caught the ridge and pulled back to within a few feet of flag. I’ve seen people use the natural backstop here with mixed results. Sometimes it releases and sometimes … well, have fun chopping it out of a severe downhill lie toward the water. It’s the least likely of the four to eagle, but probably the most likely to birdie because it forces you to play smart. No. 15, 543 yards (blacks), 520 (blues), 492 (whites) – Another elevated tee to a downhill fairway, and the trickiest tee shot of the four par-5 tee shots. The fairway is a dogleg left and you don’t have nearly the room right that it appears. In fact, it seems to run out at around 250 yards and then sends you sailing into the canyon. You need to adjust left – and possibly left again – and choose an aim point that fits your shot shape. I originally took it at the bridge in the distance and drew it back. I’ve since adjusted even inside that. I’ve had the edge of the distance office building suggested as the line for those who hit a fade. You really can’t go too left here as the hill brings you back to the fairway most often. But again, a big drive here will catch the gravity train and really go. I’ve seen a 400-yarder here. The second shot involves a ravine carry, but that’s non-factor if you’re really in eagle range. I’ve gotten home easily with a hybrid here and actually, for me, this has been the most reachable green of the four. The biggest obstacle to eagle is that mounded/tiered green and pin placement. Left is a definite eagle pin, but reaching the lower right side takes either extreme marksmanship or one lucky roll on the green. The green makes me rank this as the second most probably hole to yield an eagle. No. 16, 558 yards (blacks), 550 (blues), 492 (whites) – Even if you don’t play the tips, you might want to hit one here just for the view, which catches more of the gorge than the blues and whites. It’s one of my favorite views on the course. Tag one here and you’ll watch your ball soar above the valley and hopefully settle in with 230 or less to get home. The left side of the fairway takes off a little distance, but the right gives you a better angle on a hole with a dogleg left at the end. In all likelihood, you’ll have a blind approach. The green resides to the left of the pine tree on the cart path and is elevated and surrounded by bunkers. It’s a smallish target but I’ve landed a hybrid there with no trouble. Last time I played, I nearly reached with a 5-iron after teeing off from the blacks. My ball failed to draw, however, and I landed in the cluster bunkers to the right, but I was able to get up and down. The layup is the smart play, but other than a possible OB, a missed run at the green is plenty salve-able here. Eagles are more rare here than 5 & 15, but birdies still abound. Anyway, if you’re feeling on your game with your driver, now you know where to go to squeeze a little more out of your long game and hopefully have birdie or better on your card to show for it. This entry was tagged Carlsbad, Par-5s, The Crossings. Bookmark the permalink.